These global ages induce many business persons from all over the world to work in Japan or with Japanese. PJA sincerely wishes to be a good supporter and become a 'bridge' connecting those people and Japan. Through our "tailor-made" lessons, we are sure you will earn success in doing business in Japan and have a deeper insight to our culture and society. We are confident that our trained and experienced lecturers at PJA will meet your needs and make your life in Japan extremely enjoyable. Now is the time to take action and join our lessons! You should find that Japanese is fun to learn and easier than you may have thought. Noriko Mizuta, Principal of PJA started her carrier as a teacher of Japanese Language in Australia, and has now 20 years Experience. 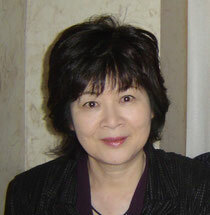 Before establishing PJA, she worked at Japanese School for 12 years as the Chief Lecturer of Japanese and have taught students from more than 50 countries. Especially, her private class lessons are highly reputed because of her experienced insight in preparing curriculum based on the proper needs analysis.